Sand seems very ordinary, you may have walked on the sand on the beach or played in the sand in your backyard, but it actually is quite unique! Each grain of sand actually looks different up close with a microscope and has different properties when it is dry versus when it is wet. The following activities will help you explore the peculiar qualities of sand and also investigate earthquakes. We hope you enjoy these activities and do them together as a family. Is sand a solid or a liquid? Sand may seem ordinary, but actually has many interesting things about it that scientists study. Sand can actually at times be like a solid (such as one the beach) and at times be like a liquid (such as when poured from a bucket). Discover some more interesting things about sand using funnels in this activity! What kind of sand makes the best sandcastles? Sand is very unique in many ways, including the way it works when it is mixed with water. 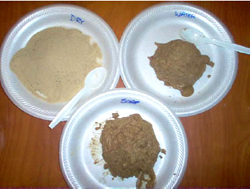 In this activity, you can examine whether dry sand, wet sand, or soapy sand make a better sandcastle! Have you ever heard of the Brazil Nut Effect? It may have a weird name, but it is an actual phenomenon! In this activity you can discover what exactly this strange named effect is and investigate it in your home! What causes earthquakes? The strongest earthquakes can cause mass devastation and threaten human lives and property. In this activity, you can recreate the mechanisms that cause earthquakes in the comfort of your own home! Is all sand the same? Actually, sand from different places, such as the beach and your backyard sandbox, look different up close and are made of different things. In this activity, you can discover some special things about sand and how it piles up! How do you measure the strength of an earthquake? The Richter Scale is a way that scientists measure the intensity or strength of an earthquake. The instrument used to measure earthquakes is called a seismograph, and you can make one of your own!